Summer continued full bore in August as the hot weather of June and July continued into the month. 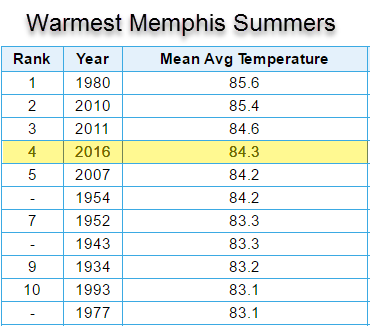 In fact, August placed in the top 10 hottest on record in Memphis (#10), meaning that all three summer months were ranked in their individual top 10 warmest. At the end of August, a new record was established for consecutive days above 70°, standing at 82 days. The hottest day of the month was 99° on the 5th. The summer will best be defined by its persistent heat and warm nights, not extreme highs, as the mercury only touched the 100° mark on one occasion. A two-month-long streak of average temperatures above 80° ended in the middle of the month, as well as a 72-day streak of highs at or above 88°. Both of these streaks rank in the top 3 longest on record. The average temperature of 84.3° for June-August was 2.9° above the climate average and ranks as the 4th hottest summer in Memphis' recorded history. In terms of precipitation, the month started dry, but thunderstorms were abundant during the mid-month period, ending with above average rainfall for the metro by over 2.5". 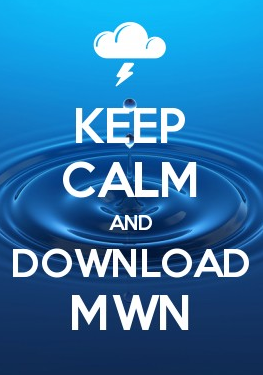 Four days recorded more than 0.75". For the summer season, Memphis ended with 14.72" of rainfall which is 3.62" above the long-term climate average. Only two severe weather warnings were issued for the month in the metro, one over Memphis and the other for eastern DeSoto and northwest Marshall Counties. No severe weather reports were received in the Memphis metropolitan area. Records set or tied: Daily record high minimums (warmest low temperatures) were tied on the 2nd (81°), 10th (81°), and 30th (79°). Comments: 22 days recorded highs at or above 90 degrees in August, which is 2.8 more than average. 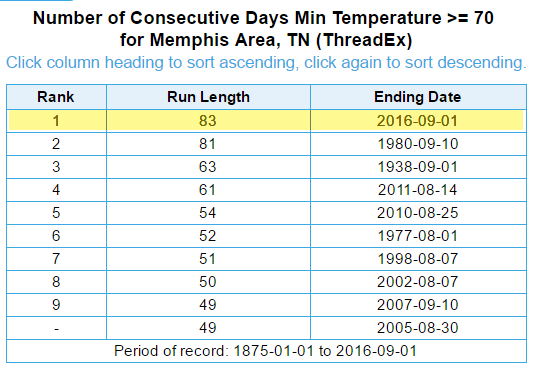 This month tied for the 6th warmest August on record in Memphis. For the year, the average temperature is 67.0 degrees, which is 2.0 degrees above normal and ties for fourth warmest January-August period on record. Comments: Three days recorded one inch of rain or more. Through the first seven months of 2016, Memphis International Airport has recorded 49.81" of precipitation, or 14.43" above average (141%). That also ranks as 7th wettest on record for the January-August period.